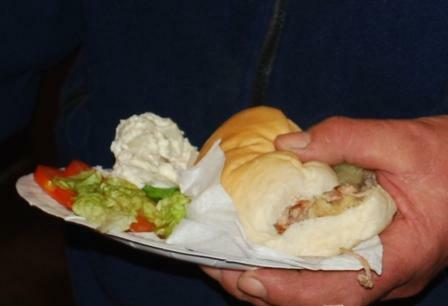 Our most recent Hogroast was at Bentham Auction Mart, a full hog served with apple sauce & stuffing, green salad, coleslaw and potato salad and Classic Pork Sausages and Burgers. It was a full day as the Hog had to go on at about 10am to ensure it was cooked through for serving at 6.30pm and to guarantee that fantastic crispy crackling! Our Classic Pork bangers and burgers were also served along with the pork sandwiches. Full Hog cooking in the hog roast machine, crackling looking good! This entry was posted in Eating, Food, Yorkshire Dales Food and tagged apple, burgers, coleslaw, hog, hogroast, pork, potato, roast, salad, sauce, Sausages, stuffing. Bookmark the permalink.